You may complete part of your training online for many courses. Below are links to our most frequently requested courses. Once you enter American Heart Association's website you will find almost every course available from basic to advanced. 1. Go to American Heart Association's website for online training. 2. Complete the desired training and print out your completion certificate. 3. 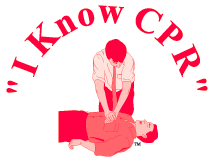 Contact I Know CPR to schedule an appointment for skills verification.